A reporter raised a concern about the lack of policy enforcement for the five and a half hours driving limit at Dial-a-Ride. The policy states that drivers must take a 30-minute break when reaching this time limit. Though there is a 15-minute buffer for factors such as traffic, it does not provide enough time, resulting in exceedances of the limit. The concern was that this is resulting in fatigued drivers, unable to fully concentrate, and running the risk of an accident. It does not appear the policy is being enforced effectively. ensure drivers are not exceeding the recommended driving limit and that they are taking a personal needs break? consider increasing the current time buffer to reflect the congestion experienced in London? 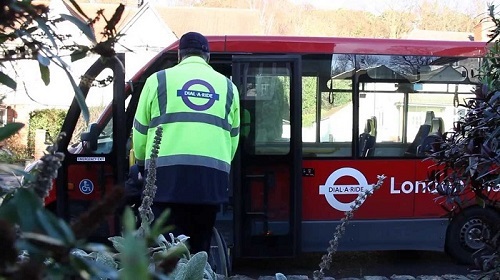 Dial-a-Ride runs a member only, multi-occupancy door-to-door service across London dedicated to assisting those who are unable to, or struggle to, use mainstream public transport. We complete in excess of a million trips per year, operating between 0600-0200, seven days a week, 365 days a year. Unlike a conventional bus route, we do not travel along fixed routes. Our drivers spend a lot of time in built-up residential areas dropping off and collecting passengers. This leaves our drivers at the mercy of school start and finish times, roadworks, one-way restrictions, width restrictions and accidents. This means we are constantly striving to balance the need to run an efficient and time critical service for our members, while ensuring our driving staff are sufficiently protected from fatigue. Passengers cannot be rushed because of their specialist needs and they certainly cannot be abandoned because a driver is running late. Sometimes a Church service will overrun, or the queues at a supermarket will be particularly busy, or somebody hasn’t finished their lunch club meal. If our driver didn’t wait to collect them and take them home, they would be left stranded, or dependent on a taxi/family member. Understandably these issues have an effect on drivers’ schedules. our drivers can see the next ninety minutes of work they have scheduled and are informed of their meal break time before their shift has begun so they can plan ahead. In addition, the business is currently looking to reschedule all drivers’ runs to ensure meal relief breaks appear between two and a half and five hours. This will create a 40 minute ‘buffer’ for drivers, with the latest possible meal relief break to protect against late running when a passenger is on board and needs to get to their destination.